This is my first attempt at making a vegan fruit tart and experimenting with vegan pastry cream. Overall, I think that it came out really good. The pastry cream is flavorful, creamy and holds up well to cutting and to the weight of the berries. I'd like to continue experimenting though using different types of sweeteners such as agave or palm sugar, and possibly other thickening/emulsifying agents. For the pate sucree, I used whole wheat pastry flour instead of regular a/p. It has a crunchy cookie-like texture and tastes really great! 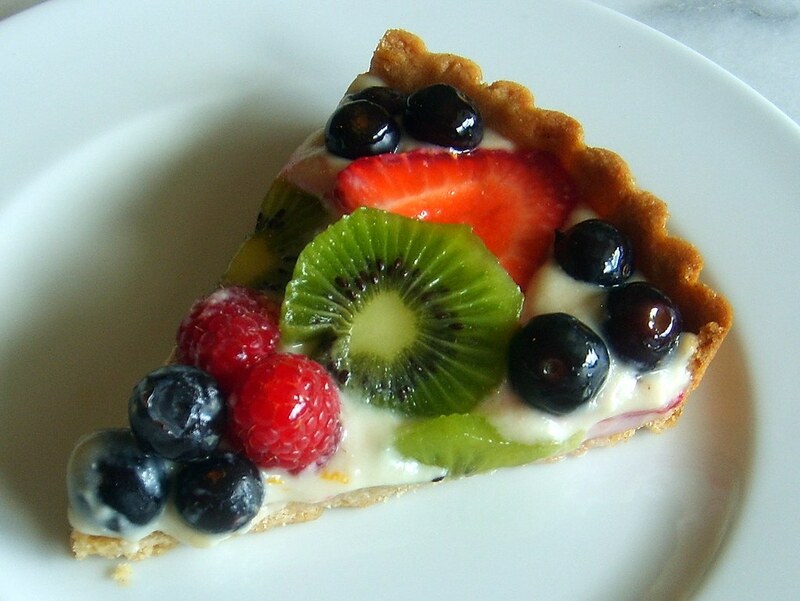 Fruit tarts are meant to be eaten shortly after making because the longer the berries sit, the more they will break down and release their juices, which will make the pastry cream soggy and eventually the crust. Most bake shops avoid this problem by adding gelatin to their pastry cream to give it structure. I've never been a fan of any type of gelatin, including agar-agar. So if you plan to make this tart and have it sit out for any extended period of time, you should consider adding agar-agar to the recipe. If you choose not to, then just make sure that you keep it chilled until ready to serve and it should be fine. In a small bowl whisk together tofu, almond milk and vanilla extract and set aside. In a food processor, add flour, and sugar and pulse to combine. Add frozen butter pieces and pulse until mixture resembles course meal. With machine running, add liquid mixture and pulse until dough pulls away from the side and starts to form a ball, about 15 seconds. Remove dough and knead lightly and form it into a flat 6" disk. Wrap tightly with plastic wrap and place in the refrigerator for at least an hour, but can be kept for two days. Preheat oven to 375 degrees and place rack in the middle of the oven. Remove dough from refrigerator and let sit for a few minutes to make rolling easier. Lightly dust surface with flour and roll out to a 13" round. To transfer dough to the tart pan, roll dough lightly around rolling pin and unroll dough over top of the tart pan. The tart pan I used is 9-1/4". Press dough in tart pan and remove excess dough from the edges. Prick the bottom of the tart pan with a fork several times and place in the freezer for 30 minutes before baking. Remove from freezer and line the tart pan, including the edges with foil and then fill with dried beans. Place tart on a baking sheet and bake for 30 minutes, turning tart after 15 minutes. Remove foil and beans and bake for another five minutes until golden brown. Remove from oven and let cool on a wire rack until ready to use. Soak cashews for at least four hours to soften, drain water and place in a blender. Add 2 cups water and blend for about 4 minutes until smooth. Strain through a fine mesh strainer. In a small sauce pan, add 1 1/2 cups cashew cream, 1/4 cup sugar and heat to a simmer. In a small bowl whisk together 1/2 cup cashew cream, silken tofu, sugar and tapioca starch until creamy. Add this mixture immediately to the heated cashew cream and whisk until thickened and bubbles burst on the surface. It should be really thick, but easily spreadable. Remove from heat and whisk in vanilla bean seeds or vanilla extract, butter, orange zest and the lemon juice. Pour into a bowl and place plastic wrap directly on the surface to prevent a film from forming. Let pastry cream chill completely before using, at least three hours. Note: It's very important that you purchase organic berries because you do not want to wash the berries before decorating the tart. The berries must be incredibly dry or they will cause the pastry cream to become soggy. Also, choose the most beautiful berries you can find, blemish free. 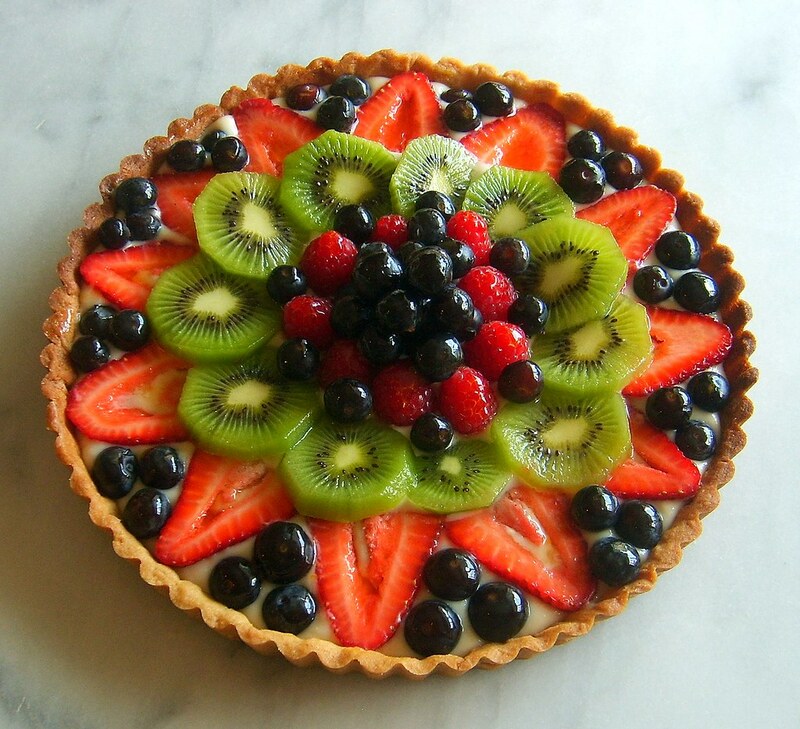 Decorate the tart with the fruit in any beautiful pattern you like. Heat apricot jam until melted and strain syrup into a bowl. Using a small pastry brush, dab apricot syrup on fruit to create a beautiful sheen. Chill until ready to serve. The tart should be eaten within a couple of hours after assembling.